Climate change is creating a disaster on Australia’s doorstep, with environmental degradation and the demand for sustainable sources of food undermining stability in some countries, especially “fragile states”, according to the Australian government’s first foreign policy white paper in more than a decade. The new white paper, released on Thursday, contains warnings over the disruptive effects of climate change in Australia’s immediate region, noting that many small island states will be “severely affected in the long term”, and the coming decade will see increased need for disaster relief. The white paper notes the demand for water and food will rise, with the world’s oceans and forests under intense pressure. It notes climate change and pressure on the environment could contribute to conflict and irregular migration, impacting specifically on Australia’s economic interests. Despite the obvious challenges for Australia and the world posed by Donald Trump’s presidency, and a live debate in this country about whether Australia needs to rethink the American alliance, the white paper makes a strong case for the United States to remain engaged in the region to counterbalance China’s increasingly assertive posture. It notes that the postwar alliance with the US “is central to Australia’s security and sits at the core of our strategic and defence planning”. While the white paper makes the case that it is in Australia’s interests to pursue a cooperative relationship with China, it contains language critical of China’s military posturing. It characterises the disputes that have emerged in the South China Sea as “a major fault line in the regional order”. “Australia is particularly concerned by the unprecedented pace and scale of China’s activities,” the paper says. “Australia opposes the use of disputed features and artificial structures in the South China Sea for military purposes. With strategic tensions in the region on the rise, the white paper foreshadows a more activist Australian engagement with the democracies of the Indo-Pacific, meaning Japan, India, Indonesia and Korea – and more active support for the Association of Southeast Asian Nations (Asean) countries, where China is attempting to assert diplomatic dominance. It also underscores the “grave and growing” threat posed by North Korea, characterising the behaviour of the Pyongyang regime as the most immediate security challenge for the region – while referencing the ongoing global threat from terrorism and insurgencies. Australia has been active in countering Isis-linked militants in the southern Philippines. The white paper also references the political challenges of the age, charting rising anti-globalisation and populist sentiment. “Doubts about openness has grown, as have concerns about the effect of globalisation, mainly immigration, on cultural identity and social cohesion”. It notes that politics in some countries has become more fragmented and “volatile”, with nationalism and protectionist sentiment on the rise, with global governance and the rules-based order now contested. It notes that a more inward-looking world is a world less likely to rise collectively to meet collective security challenges. 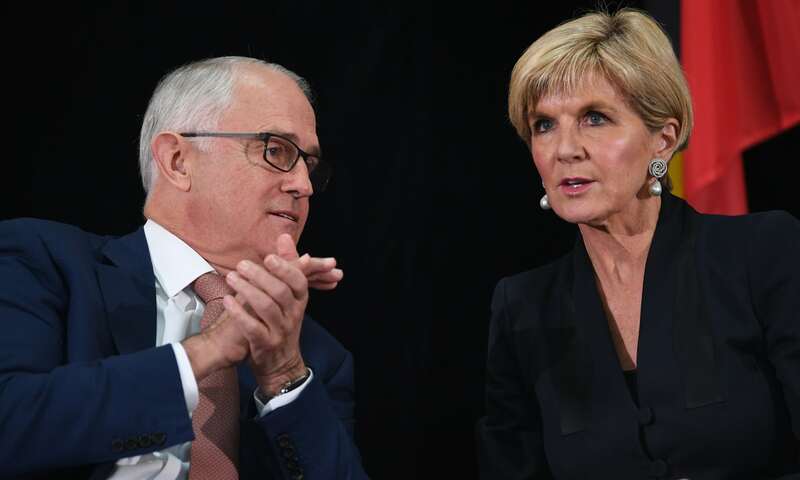 “We will be living in a more contested and competitive world,” the foreign affairs minister, Julie Bishop, said Thursday. She said Australia would step up support for “our neighbourhood, where we have distinct responsibilities” and resist the “false hope of protectionism and isolationism”. In signalling a more activist role for Australia in the Indo-Pacific, the prime minister said that, in the past, “we could safely assume that the world worked in a way that suited Australia”. Malcolm Turnbull said the world was experiencing unprecedented prosperity and opportunity “but the liberal, rules-based order that underpins it all is under greater stress than at any time since its creation in the 1940s”. He noted that Australia had entered a period where its dominant security partner, the United States, was not its dominant trading partner, China. “We must see this as an opportunity, not as a risk,” he said. The prime minister said the white paper provided “a framework for securing our own future, while sharing the burden of collective leadership with trusted partners and friends”. Turnbull said Australia had no intention of degrading the postwar alliance with the US but the contemporary climate meant “pursuing our interests as much in San Francisco as in Shanghai, and always on our own terms”. Turnbull said the US would remain a significant presence in the region, “leaving aside one administration or one president”, because it was “manifestly in America’s long-term national interest today, tomorrow and as it has always been”.